It’s been less than 2 weeks since the passing of Raymond Weil, honorary president and founder of the Raymond Weil Swiss watch brand. Mr Raymond Weil’s independent mind and kindness will continue to inspire us every day. -From a statement that appeared on the Raymond Weil Watch Brand’s Official Website on January 27 2014, the day of his passing. Raymond Weil was a self-made man…He was my mentor, and I learned so much from him. His legacy and enthusiasm will live on through our family, his brand, its team over the world, and all of those who wear the watch that bears his name. …his watches are based on the ideal of combining classic styling, exceptional Swiss watch craftsmanship, and reasonable pricing. 1926: Raymond Weil is born in Geneva. 1949: After receiving his diploma in commerce, Raymond Weil begins a 16 year career at Camy Watch S.A.
1976: Raymond Weil creates his own company during a crisis that impacted the entire watch industry. And of course… watch making. Raymond Weil continues its sonata of complications and craftsmanship in its latest Maestro Phase de Lune Semainier watch. The overall design ensemble of the Maestro Phase de Lune Semainier is so ornate it enraptures one’s visual senses when reading the time, day, date, month and moonphases. Maestro Phase de Lune Semainier (Reference 2859-STC-00659) stunning silver colored dial is a beautiful arrangement with notable guilloche patterns accentuated with a 12 month calendar circling the circumference of the dial, black Roman numerals and three subdials: date (at 3 o’clock), day (at 9 o’clock) and moonphase (at 6 o’clock). The midnight blue hour/minute, sweeping seconds, subdials indicators and crescent hands bear somewhat of a striking resemblance to those found on Breguet timepieces. Maestro Phase de Lune Semainier playfully exhibits these amazing features inside a round 41.5mm stainless steel case with a case height of 10.35mm which is protected by an anti-glare treated sapphire crystal. The Raymond Weil signature logo crown which when turned clockwise sets the time, and also changes the date and displays time for morning or afternoon. The case design harmoniously incorporates four functional push-buttons at 2, 4, 8 and 10 o’clock. The push-button at 10 o’clock sets the date; at 8 o’clock sets the day of the week; at 2 o’clock sets the week; and 4 o’clock sets the moon phase using the calendar below. It is also recommended that the watch be set using the crown and utilizing each push-button in the order (10, 8, 2 and 4) as previously fore-mentioned above. Maestro Phase de Lune Semainier is a Swiss Made watch featuring a mechanical with automatic winding movement – Caliber RW 3600, which includes the moon phase, month, week, day and date functions. It has a 42 power reserve, an exhibition sapphire crystal caseback, and it is water resistant up to 50 meters (165 feet). It is adorned with a leather strap featuring alligator finish with saddle stitching and a traditional buckle. Looking for a great, classy everyday watch? Raymond Weil will be wrapped around your wrist with their Tradition Date timepiece. The design is simple and elegant, with a steel bracelet very comfortable on your wrist, and with Swiss quartz movement. It isn’t flashy, but luxury doesn’t necessarily mean lots of bling. The watch was created for women wanting a quality timepiece to wear to the office or the playground. The bracelet boasts an understated elegance that also looks great with evening wear. One of the best things about this style is the bracelet doesn’t pinch your skin like so many others. Comfort was in mind when crafting this timepiece. The classic Roman numerals contrast on the crisp white dial making it easy to read. The 28 mm diameter case fits perfectly on most women’s wrists. While the watch is water resistant up to 50 meters, it is not advisable to wear it swimming. If the crown is not screwed down properly or the seals in the watch are old, the watch is at risk for water damage. Also keep in mind when changing the battery, you must send it back to your warranty-authorized repair place in order to keep your warranty valid. The date window is very small. The size of the watch looks best on small wrists. The Raymond Weil Tradition Date works well with any outfit or occasion. Its conservative design makes it an excellent timepiece for any lady. The price point allows for many people to own a Swiss timepiece to pass down for generations. This watch also comes with an equally elegant strap option for ladies that prefer a strap versus a metal bracelet. The original Raymond Weil Maestro collection made waves in the world of luxury watches with its super sleek, modern vintage look and innovative watches. The men’s Maestro collection consisted of over 20 different variations of the minimalist chic luxury watch but why should men have all the fun? Raymond Weil recognized that maestros or masters in the practice of their art aren’t found only in men but equally in women as well. 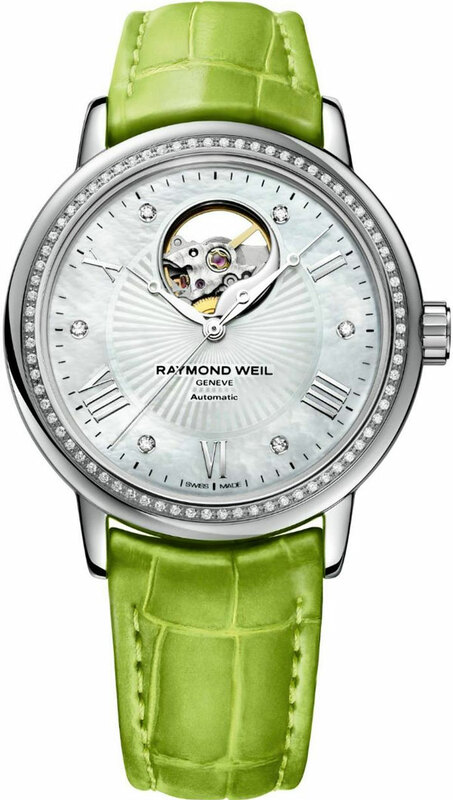 The Lady Maestro by Raymond Weil is a very feminine and colorful version of the original model. With an ample 39 millimeter case, an automatic open balance wheel, mechanical movement with automatic winding, a 38-hour power reserve, sapphire crystal with anti-reflective treatment, mother-of-pearl dial, comes fashioned with six diamonds and colored alligator leather straps. One of the most unique features of the Lady Maestro is all of the gorgeous alligator leather straps that are available. Imagine a range of watch straps that come in rainbow of colors which Raymond Weil likes to call a symphony of colors, from classic black to neon candy colors to deeper colors that are vibrant yet still suitable for the workplace. For those who prefer metals to leather, there are also Lady Maestros that come with stainless steel bracelets and even steel on steel watches. Another bonus of the Lady Maestros is that they all come encrusted with diamonds to draw even more attention and light to the dazzling timepiece. The Lady Maestro is a refreshing change of pace with the chic design, diamond accents and bright and bold watch straps. Breathe some into your work wardrobe or add a touch of luxury to your casual wear. The Raymond Weil Lady Maestro transitions well from work to drink to afterhours as well as weekend getaways and intimate nights at home. The ladies counterpart to the timeless classic is much more versatile and stylish than the gents’ version so ladies should not feel like their version is the lesser of the two. The Lady Maestro combines the perfect combination of fun, flirty colors, precious gems and metals, classic design and quality craftsmanship that is unmatched among other ladies watches out on the market. This timepiece will instantly elevate any look and help you to look more polished and on-trend. 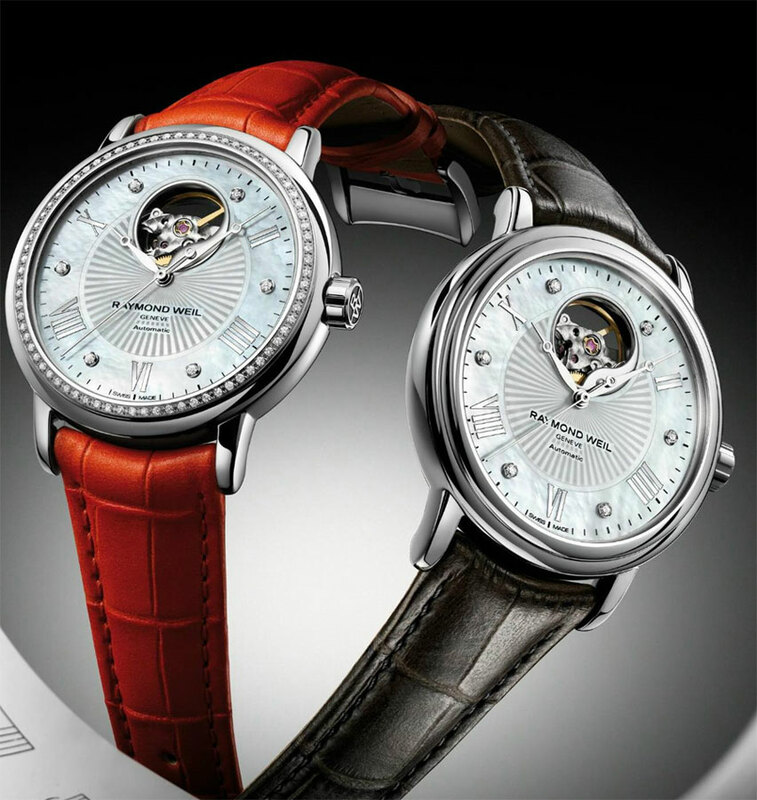 Raymond Weil’s latest take on the Lady Maestro proves that they are also still masters in the art of watch making. Raymond Weil opened its 7th Annual International Photography Competition October 1, 2012. Photographers that possess a talent and passion for shooting photographs are being invited to submit one JPG format photograph that captures an artistic image with an idealic theme and focus of “Precision is my Inspiration” (the acclaimed Swiss luxury watchmaker’s brand slogan). Raymond Weil annually seeks out an aspiring artist whose passion of artistic expression rivals the very precision it dedicates in its watchmaking. This year’s competition is no exception and what better theme than Raymond Weil’s brand slogan, Precision is my Inspiration, to caveat its 7th annual photography competition. The competition opened October 1, 2012. Interested contestants can register and find the requirements for a photograph submission on Raymond Weil’s website (or click on this direct link to register http://www.raymond-weil.com/EN/Photography-Competition-2012/All-About.html ). The registration deadline is November 30, 2012 at precisely 11:00 GMT. The photograph artworks submitted will be reduced to a selection of 20 pictures, which will be presented online at Raymond Weil’s official Facebook page. Raymond Weil followers will have an opportunity to vote for the photographs they favor best. The winning photograph that garners the most votes wins an amazing $5,000 USD case prize, exhibition in a renowned gallery and international media coverage – the highlights of this year’s contest. Silvia Pogoda in the Europe and Africa region for his artistic photo artwork of a man in a hotel room. Omar Gamez from the Americas region photo of a man suspended in mid-air while hugging a tree trunk. Yuan Weifa from the Asian region with a photo of a traditional hump-backed bridge photographed in the rain. Mathieu Benard-Reymond, was however, the 2011 International Grand Prize winner with his artwork, “Crude Oil Prices”. This is an international competition so photographers grab your cameras, aim and shoot your best artistic expression that best exhibits precise inspiration. Good Luck!